The 1176LN Peak Limiter is a compressor introduced by UREI in 1967. The 1176LN was inducted into the TECnology Hall of Fame in 2008. At the time of its introduction, it was the first true peak limiter with all solid-state circuitry. •	It used a FET for gain reduction, in a feedback configuration. The 1176 underwent a number of revisions including the addition of Brad Plunkett's low-noise (LN) circuitry to produce the 1176LN. This reduced the noise by 6 dB and redistributed the noise spectrum, producing even more noise reduction in the sensitive mid-range. Revisions D and E are reputed to sound the best. •	Universal Audio Re-Issue (2000/4/1) is based on “D” and “E” models. It was common to use the 1176 in 'all-button mode' or 'British mode'. This was when all four of the ratio buttons are pressed simultaneously. 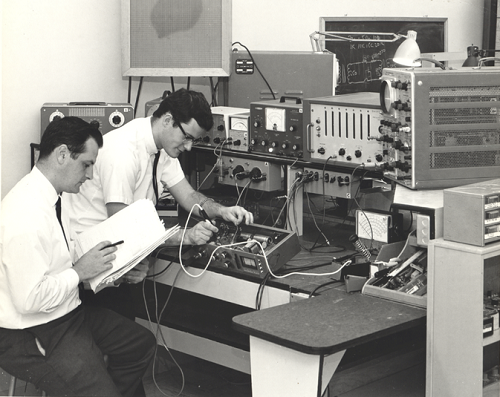 Universal Audio engineers bench testing the original 1176 Limiting Amplifier, circa 1967. Do you have content, to add, about the Urei 1176 Peak Limiter or associated topics? Please feel free to Share it, here!